No customer service rep wants to answer the same question a hundred times a day. No sales rep wants to talk to people who aren’t going to buy. And if you’re leading an organization, you can’t afford to let either of those scenarios be the norm. Chatbots (more affectionately known as virtual assistants) provide a solution to both of these problems. Their infinite capacity helps free up your employees and scale your organization’s efforts. Whether you use chatbots for customer service, sales, or something else, their artificial intelligence ensures that your human resources are only used when they’re needed, and that your organization communicates with the most people possible. But the fear many organizations have is that chatbots are heavy on the artificial and light on the intelligence. Few things are more infuriating when you need help than having to repeatedly rephrase your question or jump through hoops to talk to a real person. Most of us prefer talking to humans, and that’s OK. That’s why chatbots are most-suited for highly specialized tasks. The best chatbots interact with more people faster than humans will ever be able to. The trick is knowing when and how to use them. In many cases, you’ll find that chatbots are basically a more informal way for people to navigate your website. To help you see if there are opportunities for your organization to use chatbots, we found 10 case studies of companies that used them successfully. We’ll show you what they did, how they did it, and where you can go to see the full case study. Some of these organizations started with live chat systems before switching to chatbots. Some used chatbots conservatively, and others used them for everything. Check out these 10 case studies on chatbots. Chatbots with advanced AI provide site visitors with a “self-service” option. 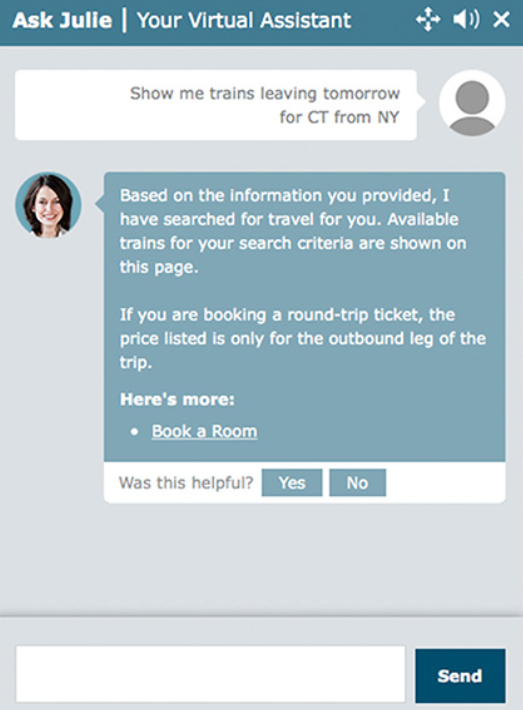 Where the study came from: Next IT shared this chatbot case study on their website about Amtrak’s experience with “Julie”, which began in 2012. Amtrak is the largest organization you’ll find in our list of case studies. They have 20,000 employees and serve 30 million passengers per year. At the time Next IT published this case study, Amtrak.com was getting 375,000 visitors every day. Using Next IT’s advanced AI chat platform, they created “Ask Julie” to help visitors find what they needed without having to call or email customer service. Instead of making a phone call or waiting for customer service to email them back, more and more visitors are turning to Julie. In fact, Next IT reported a 50% growth in Julie’s usage year over year. Julie “was designed to function like Amtrak’s best customer service representative,” and with 5 million answered questions per year, it’s hard to argue that she isn’t their best customer service rep. So in addition to answering more questions and increasing the number of bookings, Julie actually increased the value of bookings. Bookings made through Julie resulted in an average of 30% more revenue than bookings made through other means. Clearly, the self-serve model is working for Amtrak. What’s interesting about Julie is that despite the smiling face, you know you’re talking to a robot. It doesn’t feel like AI that they’re trying to pass off as a real person. It’s almost like she’s a more advanced search feature of the website. When visitors ask questions, she pulls in only the relevant information, and it’s all contextualized to fit their specific question. Maybe it’s just me, but that could be the difference between a helpful tool and a frustrating conversation. 1 in 3 buyers used the chat system before making a purchase. 9 out of 10 “big buyers” used the chat system before making a purchase. Estimated 60% of revenue comes from chatbots. Average response time was three minutes in their first 30 days of using Intercom. Chatbots allowed a two-person team to stay on top of support and sales. Popular customer questions provided content ideas, and eventually prewritten responses. Where the study came from: Pardeep Kullar published this case study on the Upscope blog in 2017. As a two-person marketing startup, Anymail finder was stretched thin between sales, marketing, and support. They were answering the same few questions over and over via email. Intercom’s operator bot helped this two-person team look and feel like they had a full-fledged support department. So Pardeep and his colleague wrote detailed articles that answered these popular questions and any related ones, then incorporated the articles in readymade responses and automated messages. 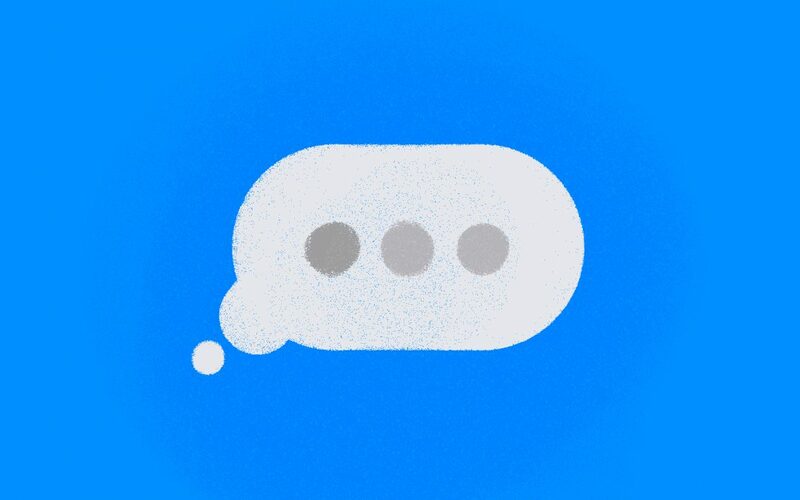 Website visitors encountered one of 10 automated chat messages, depending on the page they arrived at. It’s like putting multiple fishing lines in the water at once, waiting for potential customers or users to bite. When a visitor replied to an automated message, employees got a push notification so they could promptly respond to every inquiry. 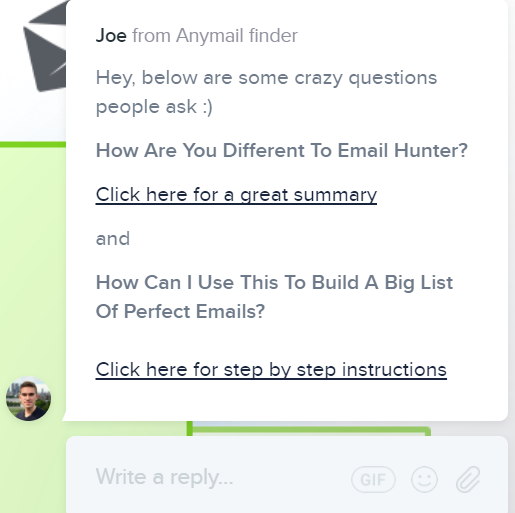 Anymail finder’s prewritten responses to popular questions let them reply to some inquiries within seconds. 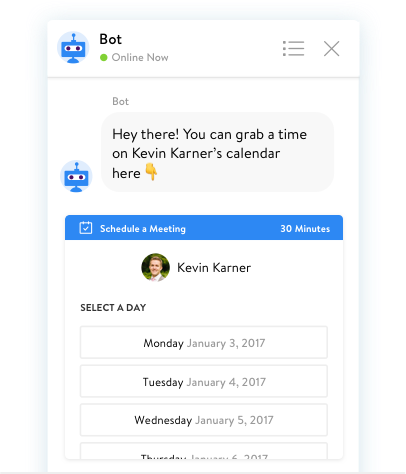 But Intercom is pretty anti-AI, and their chatbots serve a more limited role. For Anymail finder, real people were waiting behind every automated message, but chatbots still helped them provide superior customer service with a limited team. Where the study came from: Drift published this case study on their website. RapidMiner went all-in—they replaced every lead capture form on their site with a chatbot. (Even for their whitepapers!) RapidMiner realized that automated conversations could filter and qualify leads in minutes, whereas a sequential email campaign could take weeks. Drift’s Leadbot asked visitors the same questions salespeople would’ve asked—and it never sleeps, so leads trickle in 24/7. So far, it’s brought in over 4,000 leads, influenced 25% of their open sales pipeline, and accounted for 10% of all new sales. This case study provides some helpful insights into the differences between a chatbot and a live chat service, but it’s worth noting: ditching forms altogether is a pretty drastic step. Chatbots are more scalable than live chat services. MongoDB was having a lot of success with live chat, but like all humans, their salespeople were limited by things like “time” and “space.” They couldn’t significantly increase the number of conversations they were having without significantly increasing the size of their team. For MongoDB, automating lead-qualifying conversations allowed them to have more conversations, and automating the scheduling process let them turn more of those conversations into leads. Welcome messages led to a 267% increase in chat conversations. Website conversion rate increased by 36%. Targeted messages had an open rate of 30% and a 21% clickthrough rate. Welcome messages help chatbots and live chat get more engagement. In the right place at the right time, relevant, automated messages can be highly effective. Where the study came from: Drift’s case studies page shared how Leadpages used automated messages. LeadPages started using Drift’s chat system to let their site visitors ask questions. Within a few weeks, they were averaging 100+ questions per week. And they didn’t even have a welcome message. They quickly realized that there was a much bigger opportunity to encourage conversations that lead to conversions. So they added a welcome message. In the month prior to adding the message, they had 310 visitors use the chat system. In the month after, they had 1,168. That’s a 267% increase. But the quantity of messages wasn’t the only thing they were improving. LeadPages started using targeted, automated messages to try to increase conversions on specific pages. Depending on where visitors were on the website, they’d see a different message that fit with the page and asked them to take a specific action. These targeted messages had an open rate of 30% and a click- through rate of 21%. “With Drift’s automation features, we’ve been able to increase the conversion rate of our site visitors by 36%,” Robertson says. Interestingly, at the time we prepared this case study roundup, Leadpages didn’t appear to be using chatbots on their comparison page. Visitor-to-lead conversion rate increased from 6% to 20% in six months. Targeted chat let sales reps focus on leads who were likely to buy. Bypassing forms meant qualified leads could move through the pipeline faster. Where the study came from: Perfecto Mobile helped Drift prepare this case study, which was published on Drift.com. Perfecto Mobile had a problem. Most of their “leads” weren’t within their target audience. They didn’t want their sales development reps wasting that kind of time on a live chat system, so they went with Drift. If a website visitor was coming from a company that was too small to be in Perfecto’s target audience, they didn’t see the chatbot. The other major benefit Perfecto noticed was that chatbots allowed them to capitalize on leads at the most opportune time. An anonymous visitor came to the Perfecto Mobile website and started a conversation through Drift. The anonymous visitor turned out to be someone from a major sports brand, and they wanted to meet in-person with a sales rep.
For Perfecto Mobile, chatbots helped them qualify leads faster, and hand them off to the right people at the right time. 500% ROI within six months. Reduced live chat volume by 83%. Decreased time it took customers to reset passwords by 50%. Common customer service questions are now handled completely through the chatbot. Chatbots can resolve issues faster by reducing handoffs. Where the study came from: Charter Communications implemented Next IT’s chatbot in 2012. Next IT published this case study on their website. Charter Communications is the second largest cable provider and the fifth largest phone providers in the U.S. They have 16,000 employees and 25 million customers. Before switching to a chatbot service, Charter Communications had 200,000 live chats per month. 38% of these live chat conversations were for forgotten usernames and passwords. That’s 76,000 ridiculously simple requests that had to be handled by a real person every month. Obviously, all of those conversations take up a lot of customer service time. Since so many people were accustomed to resolving issues through chat, Charter didn’t wanted to pull the plug on the entire chat system, but they needed a self-serve option to save their customer service reps for more complex problems. When they switched to a chatbot, it didn’t just take over those basic password and username questions. 83% of all of chat communications were handled by the bot. That’s 166,000 chat requests per month that Charter no longer had to worry about. But Charter’s chatbot wasn’t just bumbling its way through these conversations, either. Part of their goal was to increase first-contact resolution rates, so customers wouldn’t need to be relayed through several people to get what they needed. The chatbot could also handle those tedious password and username requests 50% faster than a real person. Ultimately, chatbots delivered a solid win for Charter and for their customers. Since Facebook opened up its Messenger app for developers to create their own bots, a lot of brands have seized the opportunity to interact with their audience this way. The case studies you’ll see below are a little lighter than the ones we’ve looked at so far, but they showcase a few ways organizations are successfully using Facebook Messenger bots. Some ecommerce sites have had a lot of success with Messenger bots, but the three examples we’re going to look at are all primarily content-focused brands. 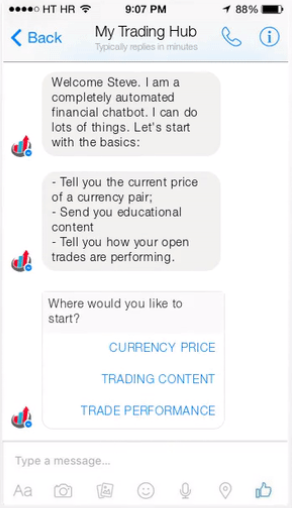 Something to think about: while the other chatbots we’ve looked at live on your website, this one lives in an app people are already using, and they can find your bot there. Facebook shares Messenger bots in the discover tab, and if you open Messenger right now and search, you’ll find “bots” right below “people.” In other words, a Facebook Messenger bot could grow your audience. 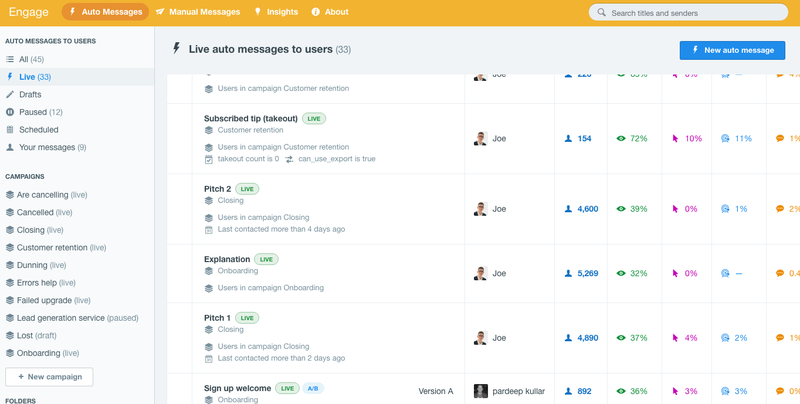 84% read rate on automated messages. 53% click through rate from Facebook Messenger to BabyCenter.com. Used a Messenger bot to drive traffic to the website. Facebook messages were opened more than emails. 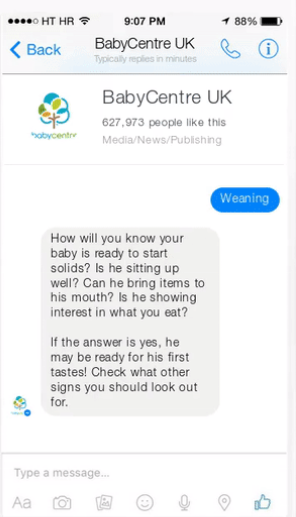 Where the study came from: BabyCenter asked ubisend to design a Facebook Messenger bot in 2016. Ubisend published this case study on their website. BabyCenter is one of the most trusted pregnancy websites out there (seriously, I’ve seen my wife’s OBGYN check this site during appointments). One of their biggest draws is a sequential email campaign that follows you every step of the way through pregnancy, and their revenue model is based on advertisements and a strong affiliate sales program. Drive traffic to their website. Provide an alternative content delivery system. As you can see in the GIF below, the bot also provided a more interactive way for people to consume BabyCenter’s content. The floating messenger icon and that little red number is a lot harder to ignore than an email. People are used to glancing at a subject line without opening the email. The load time for a Facebook message is almost instant. Email? Not so much. It only takes two taps to open a message and click through. Email takes a little more navigation. Whatever the reason, a Messenger bot was clearly a viable content delivery system for BabyCenter. If enough people adopt it, the Messenger bot may even rival their well-established sequential email campaign. 47% click through rate on automated messages. 29% increase in website traffic in six weeks. 13% increase in spa bookings. Messenger bots can help consumers navigate the website before they even get there. Where the study came from: Good Spa Guide solicited ubisend’s services in 2016. Ubisend published this case study on their website. As the name implies, Good Spa Guide reviews spas. They make money when people use the site to book a spa, so not surprisingly, they really value website traffic. Like BabyCenter, Good Spa Guide was looking for an alternative to their email list. They used ubisend to design a Messenger bot that functions a lot like Amtrak’s “Ask Julie” bot. It basically provides a more conversational way to navigate the website—but without actually being on the website. After a short conversation with the bot, people can go to the exact spa review page they need, and continue their hunt on the website. 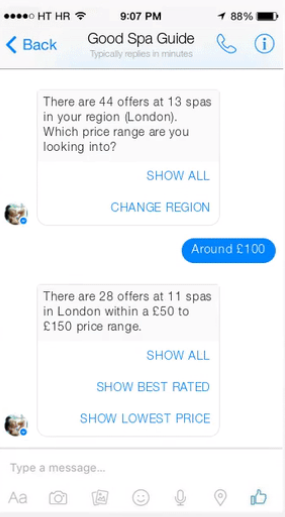 With a 29% increase in traffic and a 13% increase in spa bookings, it looks like a Facebook Messenger bot helped Good Spa Guide either tap into a new audience, or engage their existing audience in a better way. 17% increase in website traffic. Messenger bots can be very effective at keeping your audience consistently engaged. Where the study came from: In 2016, MyTradingHub was struggling to keep subscribers engaged, so they turned to ubisend. This case study was published on ubisend.com. MyTrainingHub is a web-based social and educational platform for people who trade on the foreign exchange market. 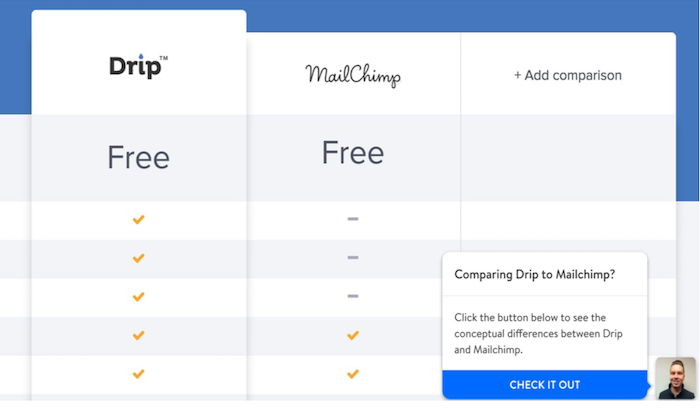 They’re after users, not customers, and they use a sequential email campaign to keep their users engaged. They decided to try an interactive Messenger bot to bring up the number of people who made it through training. They wound up creating a bot that could help people interact with the trading platform and continue their training. MyTradingHub saw their TTC metric increase by 59% following the launch of the bot, and their training pages saw 17% more traffic. In this case, it looks like a Messenger bot functioned as a sort of half-measure. MyTradingHub has been around since 2010, but to continue to be a strong “social platform,” they probably need their own app. In the meantime, MyTradingHub’s Messenger bot appears to be keeping users more engaged with their existing content. In six weeks, ubisend designed a branded chatbot with 215 conversation topics. The bot was capable of sending more than 150 messages per second. Chatbots have an insane capacity for simultaneous conversations. Where the study came from: PG Tips asked ubisend to design a chatbot for a charity promotion. Ubisend then published this case study on their website in 2017. PG Tips (a brand by Unilever) decided to turn their “Most Famous Monkey” into an AI chatbot to generate donations for charity. They wanted a conversational chatbot to tell jokes for their “one million laughs” campaign. It took six weeks for ubisend to turn a chatbot into a mediocre standup comic. (They went pretty heavy on the dad jokes.) The AI could handle 150 conversations per second and handle 215 different conversation topics. We only included this one because it shows how quickly you can set up a fairly intelligent, completely custom chatbot. After allowing developers to create their own chatbots for Messenger, Facebook shared this roundup of brands successfully using chatbots. More than 30,000 chatbots were created in the first six months they were supported on Facebook Messenger. The roundup highlights four that Facebook thinks are worth checking out. What do these chatbots all have in common? In most cases, chatbots aren’t going to fool anyone. The chatbots we’ve looked at here are obviously not real people. The brands that use them and the companies that make them might be excited about how human they seem, but that’s not the point. In the right situations, chatbots can provide customers and users with a better experience because they process your request instantly, and it doesn’t matter how many other conversations they’re having. And if you’re waiting around for basic help (like, say, password reset), you’re really not going to care if the person who’s helping you is a Bob or a bot. Unless you’re looking for something gimmicky (like a chatbot monkey that tells dad jokes), most chatbots simply provide a more conversational way for your audience to consume the information on your website. It’s certainly not for everyone—some people (myself included) would rather navigate websites the old fashioned way and read blog posts on a blog—but for many people, chatbots provide a helpful shortcut to the information they’re looking for. And that’s something you should probably care about. One clear takeaway: if you’re using a live chat service right now, a chatbot can either outright replace it or vastly improve it. Ask your customer service reps what questions they get the most and how often they get them. Go ahead, ask them. Automate the lead generation process. Deliver your content in new ways (maybe even to new people). Drive traffic to key pages of your website. Save your customer service and sales reps a boatload of time.